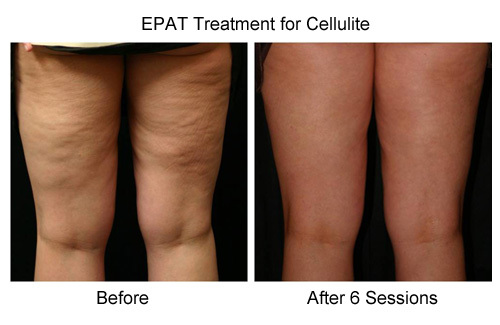 The CelluPulse EPAT treatment for cellulite is NEW at Radiant Rejuvenation! Watch this segment from The Doctors TV to learn more about the CelluPulse EPAT. Dr. Michael Lau of Radiant Rejuvenation and Cosmetic Surgery is the Medical Director of the Cellulite Institute and Clinic in the Seattle area and is an expert in cellulite. The Clinic, located at Radiant Rejuvenation & Cosmetic Surgery, is offering the most up-to-date technologies available to treat cellulite, being the first in Seattle and the State of Washington to offer the CelluPulse EPAT (Extracorporeal Pulse Activation Treatment) to treat cellulite. Please follow the link for more information about the treatment of cellulite. Cellulite is a complex problem that has caused cosmetic concerns for many women, since 80% or more women have cellulite in varying degrees. Cellulite is caused by multiple factors, such as female physiology, hormones, skin and subcutaneous structure, vascular and lymphatic flow defects, and even inflammation. The optimal way to treat cellulite should be a comprehensive and logical treatment approach, taking into account the causes for cellulite in each woman. Dr. Michael Lau’s approach to treating cellulite is based on such comprehensive and logical reasoning. Being a board certified gynecologist, Dr. Lau understands the importance of female physiology, fat metabolism and hormones on cellulite in women and will make suggestions to correct any underlying cause that may make cellulite worse for certain women. Dr. Lau is a recognized surgeon, specializing in minimally invasive and non-invasive office based cosmetic procedures. He has spent the time and effort to travel to Porto Alegre, Brazil to learn the subcision procedure from the renowned cellulite expert, Dr. Doris Hexsel. Subcision is performed in the office under local anesthesia to divide fibrous septa that cause deep dimples in cellulite. Having been a physicist, Dr. Lau is involved in the forefront of applying various energy modalities to treat cellulite. He is one of the first in the U.S. to use pulse wave therapy to treat cellulite, using the CelluPulse EPAT technology, a method that has been gaining success in cellulite treatment in Europe. Dr. Lau has been involved in using a similar acoustic technology, HIFU (High Intensity Focused Ultrasound), for medical application with the Center for Industrial and Medical Ultrasound (CIMU) at the University of Washington. He is also now engaging in research using EPAT pulse wave and shock wave for cellulite therapy with CIMU. Using CelluPulse EPAT (Extracorporeal Pulse Activation Treatment) in conjunction with other modalities, such as Thermage radiofrequency, light therapy, and topical treatment, the Cellulite Institute and Clinic and Radiant Rejuvenation and Cosmetic Surgery can offer the latest array of treatment options to help with the cellulite problem in women. One would naturally ask, “There are so many treatment methods advertized in the media, what is so different about the Cellulite Institute and Clinic in Seattle?” The answer is that one must recognize that there is no one magic cure for cellulite. The best way to approach the cellulite problem is to systematically and logically identify the probable and treatable causes for cellulite in each woman, and then tailor an individual treatment plan to address such factors, in order to achieve the optimal help for the cellulite problem. This is the exact approach of Dr. Lau and the Cellulite Institute and Clinic to the treatment of cellulite. ©2010 Radiant Rejuvenation & Cosmetic Surgery, PLLC. All rights reserved.